NEWPORT. R 1., July 23.�The races for the Astor Cups. the social event of the yachting year, were sailed here to-day, and the interest in the event was enhanced by the fact that the Reliance and Columbia appeared in a special race tor a cup offered by the New York Yacht Club. In a strong breeze and a heavy sea, the conditions which popularly are supposed best to suit Columbia. 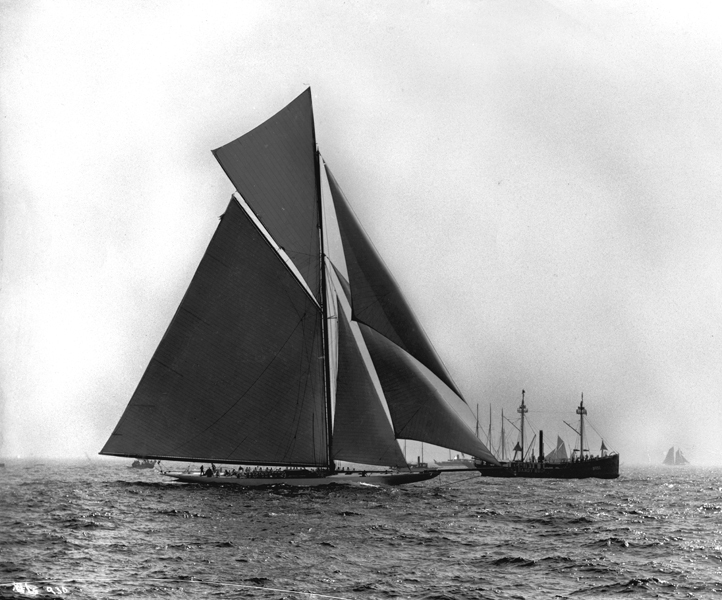 and under which conditions, as a matter of tact, the old boat did remarkably well in the June races here, Reliance beat her to�day over a thirty-eight-mile triangular course by 18 minutes and 4 seconds, the largest margin of victory she has yet had over the old boat, with the exception of two races on the Sound, when Columbia practically was becalmed. Constitution did not enter the race, as she was obliged to go to Bristol last night to replace the topmast she lost yesterday, and was unable to get back in time to start this morning. The course was a beat of 13 miles, a spinnaker run of eighteen miles and a close reach home, with an extra hitch to make the line. The wind was south-southwest until a half hour of the finish, when it went around to west-southwest and it varied in strength from ten miles at the start to fourteen at the first mark and eight at the finish.